A friend asked, in a recent comment, for some tips on getting started. Many associations offer ‘bee school’. This is what we did through the Seacoast Beekeepers Association in New Hampshire. These programs can be excellent because they reflect local realities, season specific tips, and often provide a well structured approach for introducing the novitiate to the art and craft of beekeeping. Beekeeping is not a cheap hobby but it need not be horribly expensive either. In general a beginner needs a good understanding of the vernacular that describes equipment, methods, and the bees themselves. Books abound and are helpful but may not be sufficient. Web sites are helpful too but, as one commentator said, getting advice from the internet is like asking a stranger to guard your wallet (or your purse). This shot if from April when we started our colonies. In our case we purchased supers, frames, wax foundation, a smoker, a bee hat, and feeders. 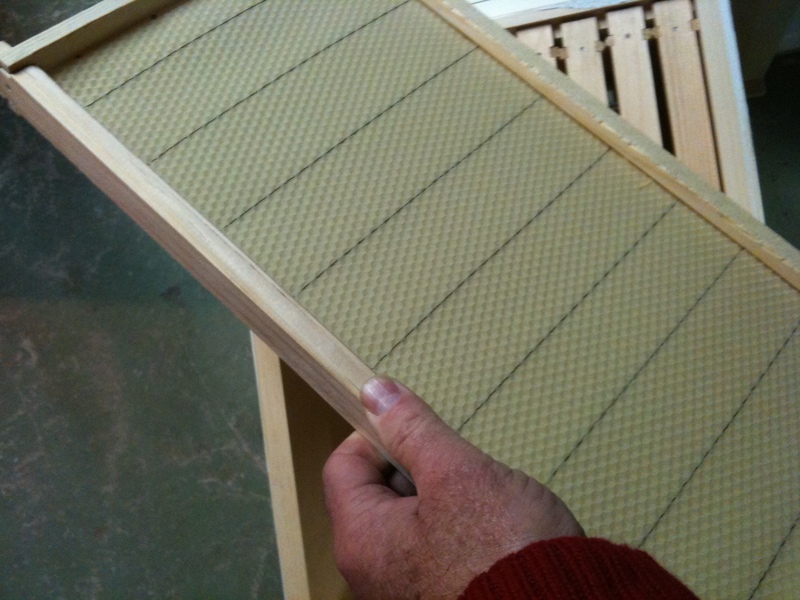 Our plan was (and is) to start with two colonies placed in two hives. (See there, I am passing on some jargon already. A hive usually refers to the habitation while a colony refers to the organic ‘collective’ consisting of a queen, a gazillion workers, and a small number of drones.) To get things going we purchased two packages. (Jargon alert!) A package consists of a queen and a nice cantaloupe sized ball of workers shipped in a box that looks a LOT like my Dad’s old cricket cage. From that point we followed the process suggested by our mentors at bee school and, with a lot of luck, our colonies should be ready to survive their first winter. Yep, that’s a fact. It takes all of their best effort to ensure that there is (1) enough comb (2) enough brood -future bees (3) enough food to make it from late October to late March. For my friend in Savannah this is not nearly as much of an issue but I am sure he will discover that even the lush gardens of his home and the traditionally mild winters are the bright side and some other threat looms periously over the future of his colonies if he decides to take up this practice. One final (for now) note. Beekeeping has changed in HUGE ways in the few years since I first considered getting into it. Twenty years ago, a box and some frames would have been sufficient. Not anymore. If you decide to keep bees, do it right. There’s a lot you can do wrong and it won’t just harm your bees, it may well do harm to many others as well.